These days, we take it for granted that television can be as good as movies (or live theater) and that great actors can deliver indelible performances on the small screen. Especially when it comes to science fiction and fantasy. But it took a small number of pioneering actors to show what's actually possible in genre television, and to expand our horizons. Here are the 10 performances that helped to define the possibilities of science fiction and fantasy television, for everyone. In particular, these are performances that became emblematic of the genre as a whole, and showed what it was possible to do with stock roles like "quirky alien" or "mad scientist." I tried to keep this list balanced between different eras, so it's not just dominated by recent performances. And I pretty much guarantee we're not going to be able to list all of your favorite performances here — so pipe up in the comments with your own selections! Sure, William Shatner's performance in the original Star Trek is also emblematic, and often-imitated — but Nimoy took a supporting role and made it a touchstone for generations of viewers. And like a lot of the other actors on this list, Nimoy was playing a common science fiction "type" — the impassive alien — and he took it to a different place. Before Spock, science fiction was full of emotionless aliens who spoke in a monotone or imitated a stereotypical "computer" inflection. Nimoy gave a whole range of nuance to the Vulcan role, conveying a lot of different stuff with every raised eyebrow or furrowed brow. Nimoy's Spock never seemed to have emotions, as we understood them — but he still had a range, and moods. 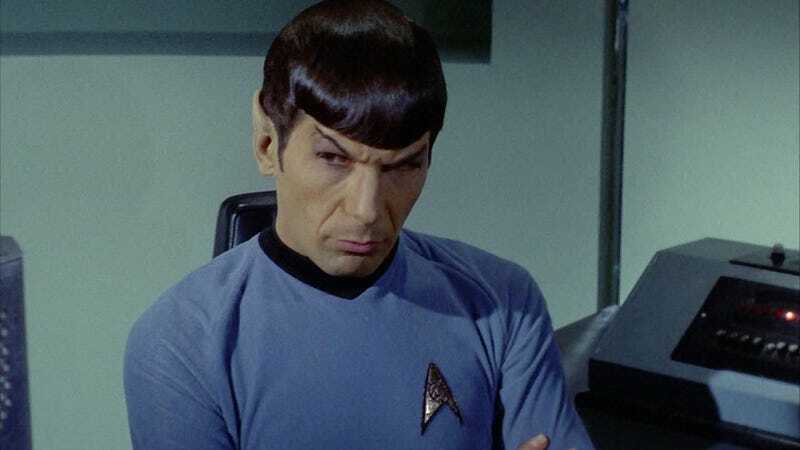 A huge host of sympathetic aliens on television owe their genesis to Spock. William Hartnell was the original star of Doctor Who, of course, and to watch Hartnell's patented "crotchety old man" performance is to be thrilled. But Patrick Troughton, who had the impossible task of taking over the role from Hartnell, really defined the Doctor's range, as a character. Every other actor who's played the Doctor since 1969 has been furnishing the house that PatrickTroughton built — from the sly subversive humor, to the capacity for immense brooding darkness when faced with ultimate evil. Watch a Troughton episode and a Matt Smith episode back to back, and you'll see Troughton's influence in every emotional shift that Smith pulls off. Not only that, but Troughton brought so much warmth and weirdness to the Doctor, he opened up a lot more space for similar "quirky" alien/scientist roles to display a lot of extra facets. A million science fiction character actors owe Patrick Troughton a huge debt. Although if you're judging purely in terms of the most "emblematic" performance, Tom Baker definitely deserves a nod as well. The late 1970s and early 1980s saw a renaissance for science fiction megalomaniacs, both on television and in movies. And a lot of them were female, including Princess Ardala in Buck Rogers in the 25th Century and Diana in V. But the best of the bunch might well have been Servalan, the fascist oppressor in this low-budget British show. Blake's 7 was only on the air for four years, but it's had an enduring influence on both sides of the Atlantic — and Pearce's insane villain is one of the things that's helped to shape a lot of things that came afterward. Like a lot of other villains of the disco era, Servalan is over-the-top and frequently campy, with giant shoulderpads and huge hats. But Pearce also let you glimpse real madness behind the scenery-chewing, and a real vulnerability — especially in "Rumors of Death," when she's chained to a "very old wall." Plus Blake's 7 managed to go a lot further with the sexual tension between Servalan and Avon than most other shows of the era — helping to inspire tons of other villains who have overt sexual chemistry with the "good guy." Star Trek: The Next Generation felt like a major step forward for television science fiction, once it got past two clunky seasons. This was a show that was willing to delve deeper than the original Trek into questions about what made us human, and the nature of reality. And Patrick Stewart was the anchor for this more thoughtful take on television space opera. He brought gravitas and thoughtfulness to the role of "starship captain," and showed that television acting could be subtle and intense. The era of "serious" actors taking roles in science fiction and fantasy shows probably started with Stewart. She started out on Kevin Sorbo's Hercules show, and then got her own spin-off as a reformed villain going around the ancient world helping people and being all heroic. Lawless helped made the television world safe for female action heroes — but she also helped to redefine the "action hero" role as something involving a lot more heart and interior life than just the standard swaggerpants archetype. Here's a pretty great article by an acting coach about all the warmth and subtle technique that Lawless brought to the role of Xena, taking a seriously campy show and infusing it with a modicum of humanity. And vulnerability. Willow starts out as the nerdy best friend, who's a well-established "type" of character to this day. She later morphs into the helpful witch sidekick, who's also a sort of character that persists on television, and then also becomes one of the first openly gay characters in genre TV. But through all of these transformations, Willow feels like a fully-realized character, with quirks that aren't just about being "quirky." Willow gets to turn evil and fall in love multiple times, and Hannigan finds ways to keep her grounded in her original dorky-sweater incarnation even after she's grown into a larger-than-life character, capable of destroying the whole world if she goes dark. The sweetness and humor Hannigan brings to Willow can be seen in every off-beat fantasy character who comes after, and as television has gotten more fantasy-oriented, Willow's legacy is everywhere. I almost left Fillion off the list, figuring that one Whedon star is enough — but Meredith convinced me that Fillion deserves his spot, for bringing a morally gray and tortured hero, who's never anything less than sympathetic, to television. In just a half season of television, Fillion had more unforgettable moments of wise-cracking and "vulnerable tough guy" greatness than most stars get in seven or eight seasons. If Lucy Lawless added vulnerability to the TV action hero, Fillion took that and added unpredictability and extra snark. Fillion never lets us forget that Captain Tightpants is scarred by being on the losing side of the big war, even without having to say anything out loud. And he never lets us forget that Mal Has A Code. I don't know how much other actors on genre television explicitly borrow from Fillion's turn in Firefly, but for fans of the genre he's one of the most emblematic, up there with Shatner and Tom Baker. Honestly, it's hard to pick the most "defining" performance from BSG — strong contenders are also Edward James Olmos as William Adama, Michael Hogan as Saul Tigh, and Katee Sackhoff as Starbuck. But when I think of the most ground-breaking performance, McDonnell jumps out immediately. It would have been a big enough deal if McDonnell had given us a strong female political leader, who radiates authority in the middle of an impossible situation — but she went much deeper than that, giving us a character who gets to do all sorts of stuff beyond being "tough". And still has her authority at the end of it all. President Laura Roslin is capable of some pretty questionable decisions, not to mention actual ethical lapses, and yet we never stop sympathizing with her and rooting for her. She even manages to have a romance with her erstwhile political opponent Adama without becoming just a love interest. And her "I am coming for all of you" speech is one of the few great highlights of the show's final episodes. We'd already seen plenty of mad scientists by the time Noble started playing Walter Bishop on Fringe — but Noble gave us the most fascinating version of madness we'd seen up to that point. Walter is capable of insane freak-outs, extreme childishness, massive inappropriateness, and utter charm, all without feeling like an inconsistent character. A lot of actors would have probably gone more over the top with a role like Walter, or given us a more consistently "lovable" version of the character, who only occasionally hints at darkness. But John Noble has been willing to go more over the edge into actual craziness, anger and self-loathing. And that's before the show asked him to create a number of other versions of Walter, including an upright, powerful version from another reality, and two past versions. There's a reason why everybody thinks John Noble has been robbed of his rightful Emmy. And finally, an actor who did actually win an Emmy. Tyrion Lannister was already a fan favorite character from the books — but he's a hard character to bring to the screen, with his whoring and his ruthlessness and his close relationship with his incestuous, child-tossing brother. I often think about the scene in one of the early episodes where Tyrion strides into the banquet room and keeps ordering food items, including extra crispy bacon and fish, while he's coping with the fact that the Stark boy has been injured and may die — and it's probably his brother's fault. There's just something so incredible about Peter Dinklage ordering breakfast, it's more interesting than most other actors delivering a huge emotional speech. But then there's also the "turtle stew" scene later in the season, and some marvelous stuff in season two. More than any other character, I'm dying to see how Tyrion copes with what's to come in season three. Thanks to Alasdair Wilkins and Meredith Woerner for the input!